If you give sparingly you will reap sparingly. “Give, and it will be given to you: good measure, pressed down, shaken together, and running over will be put into your bosom. For with the same measure that you use, it will be measured back to you.”(Luke 6:38 NKJV). “The generous soul will be made rich, And he who waters will also be watered himself. The people will curse him who withholds grain, But blessing will be on the head of him who sells it. He who earnestly seeks good finds favor, But trouble will come to him who seeks evil. He who trusts in his riches will fall, But the righteous will flourish like foliage”. (Proverbs 11:25‭-‬28 NKJV). 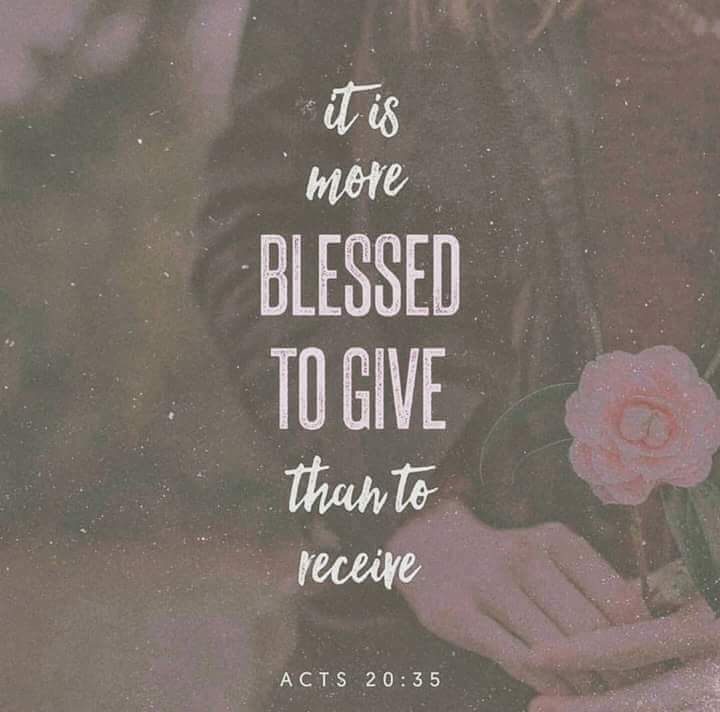 …remember the words of the Lord Jesus, how he said, It is MORE blessed to give than to receive. +Giving must always be done with the Love of God and with Faith in God. +Giving is one of the many things we do as children of God. +Giving is the beginning of receiving. +Giving is Loving, Caring and showing concern for others. This entry was posted in Daily Message and tagged give and it will come back.